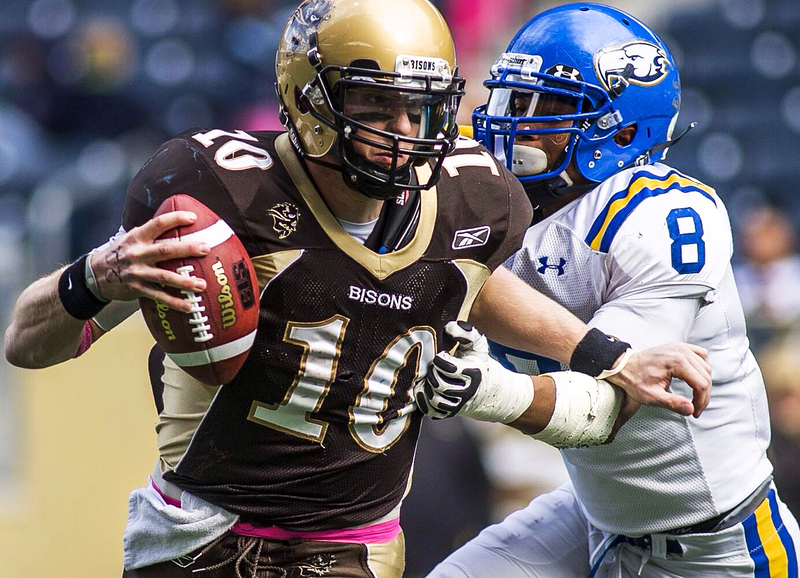 Last Saturday, the Bisons and Regina Rams competed in the last game to be played at University Stadium, a game that also had a playoff spot on the line. 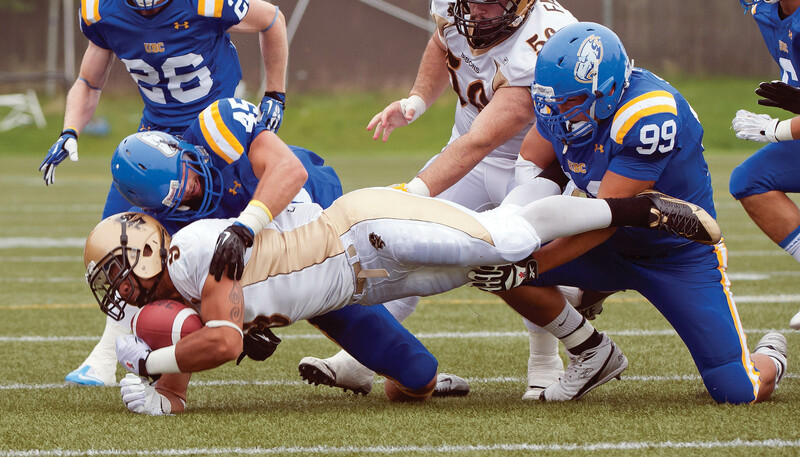 Both teams were battling hard for the last available playoff position in the Canada West conference. The Bisons came into the game with a 3-4 record, the Rams 2-5. With the Rams already holding the series tiebreaker between the two teams, the Rams would get the playoff spot if they won the game despite the two teams sharing the same record. Bison head coach Brian Dobie dutifully summed up the various emotions surrounding the historic nature of the game, as he spoke about his personal connections to the stadium. Fifteen hundred football fans braved the cold, windy weather to cheer the two teams, including three members of the University of Manitoba’s faculty of engineering marching band — impressive dedication considering they had midterms starting the upcoming Monday. Turnovers, which have plagued the Bison offence throughout the season, reared their ugly head early and throughout the game. Bisons QB Khaleal Williams threw four interceptions, including one on the first Bison drive of the game. With the wind working in their favour in the first quarter, Rams kicker Chris Bodnar scored the first point of the game with a 41-yard rouge for a 1-0 lead. The Rams played confidently for the remainder of the first quarter, capitalizing on Bison miscues and scoring 15 unanswered points — a lead the Bombers never fully recovered from. The Rams quickly scored again in the second quarter with a five-play completion, capped off with a 13-yard pass from Zack Oleynik to Adrian Charles. The Bisons were able to complete two back-to-back scoring drives, as both Williams and Anthony Coombs smashed through the Rams offensive line for one-yard touchdown runs. The second quarter ended with a great 26-yard field goal from Nick Boyd as the Bisons came within five points of tying the game, heading into halftime with the score 22-17 in favour of the visitors. Unfortunately the prediction did not come true, as the third quarter saw no touchdowns from either side. Bodnar kicked three consecutive field goals from the 11, 35 and 43 to secure a 31-17 lead. The fourth quarter was quite uneventful, Regina nursing their lead and conceding two safeties and a rouge as they held on for the 31-22 victory. Despite an early fumble that was recovered for a TD, Coombs had an otherwise solid outing. With the Rams prepared to shut him down whenever he touched the ball, Coombs courageously broke through for a touchdown and managed to accumulate 92 combined yards through the air and on the ground. Bison WR Stu Schollaardt played a respectable game, as he fought through the Rams staunch defence for 62 yards on four catches. The loss ends the Bison season and provides a disappointing bookend in the history of the University Stadium. Fortunately, the future still looks bright for the Bison football program, as a team made up of young, promising players like Coombs move into a brand new stadium and look to grow on the experiences and lessons learned through a difficult 2011 season.